The Branding Project is now completed. A brand symbolizes the meanings and values that distinguish our community from others. A brand is a promise that represents the entire experience our community’s visitors, residents and other stakeholders can expect. It can also rally the community around a central image that builds pride and unity. A brand can be a powerful influence on perceptions, intentions and behaviour, and it’s important for cities to have an attractive logo that offers some “wow” factor and makes them stand out. In Phase 1, we developed a brand story that would weave all of our experiences together. The brand story is what helps us keep a consistent message about Timmins, so that everyone is saying the same thing. Our brand story is that Timmins has a wealth of opportunities that centre on our many different resources – human, natural, knowledge-based and cultural. This brand story honours our past, but keeps us open to the future. The branding project began in March 2012. 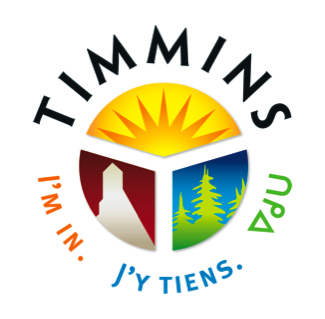 The goal was to develop a common story and image that all organizations in the community could use when promoting Timmins. A community brand allows us all to get more bang for our marketing dollars. Over 500 people offered their ideas and opinions during this process. In November 2012, the branding consultants released the results of the online Branding Survey (6.9 MB), and presented the concept to City Council in December 2012. Phase II of the project involved the creation and roll-out of a community logo, marketing materials and community signage that showcase the brand story. After more extensive community consultation (during which another 500 people provided their comments and ideas) the consultants presented the new brand to Council. Our new brand is now available for use to ANYONE who is interested in promoting Timmins, and you can download all materials and guidelines here at the Timminsbrand.ca website. Can YOU use the brand? Yes!